Towards the end of last year I took some pictures for a client of a rather unusual object. 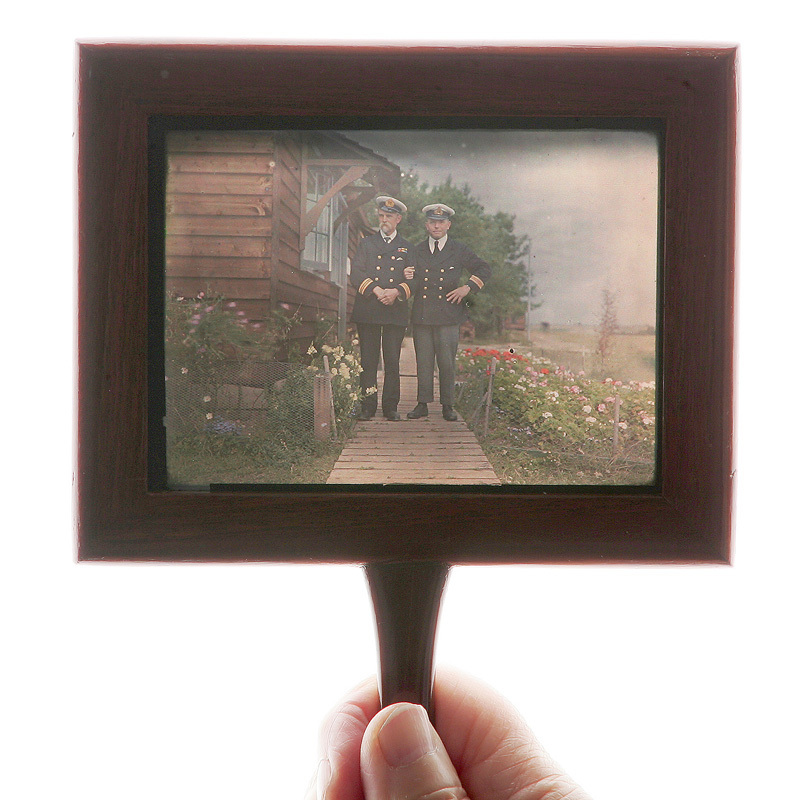 My client called and said she had in her possession a photograph of an ancestor and his colleague that appeared to be on a glass plate and was held in a wooden frame with a small handle to facilitate viewing. Based on this description I thought it might be a hand tinted ambrotype (I’m not even sure that such a thing exists but it was the only thing I could think of that would be in colour and on glass) but was curious to see it ‘in the flesh’ as I don’t often get to see images taken using historic techniques. She had tried to photograph it for a family tree she was making but without success. When I saw the picture itself I could understand why my client had had such a hard time viewing and photographing it herself. It was incredibly dark and needed significant illumination from behind to be able to see the photograph itself. I had originally thought I might be able to scan it but without a backlit scanner that wouldn’t work at all. Original frame holding glass plate. As you can see from the picture of the frame being held, I photographed it against a large softbox to provide even illumination across the whole plate. I shot with a Canon EOS-1D Mk2 (my faithful old workhorse still going after all these years and still producing brilliant images) with a Canon 70-200 f2.8 IS L lens at 145mm, f14 at 1/160s, ISO 100 (for all the technical buffs out there). I could have unscrewed the frame to see the entire glass plate but, being so old, this could have damaged the frame which would have been a real shame. Also the image itself doesn’t extend right to edge of the viewable area so nothing would have been gained from see the whole plate. Leaving it in the frame also made it easier to hold in front of the softbox! After the shoot, having seen the item itself, I asked online if anyone had any ideas as to what photographic process might have been used to create the plate – it definitely wasn’t an ambrotype. 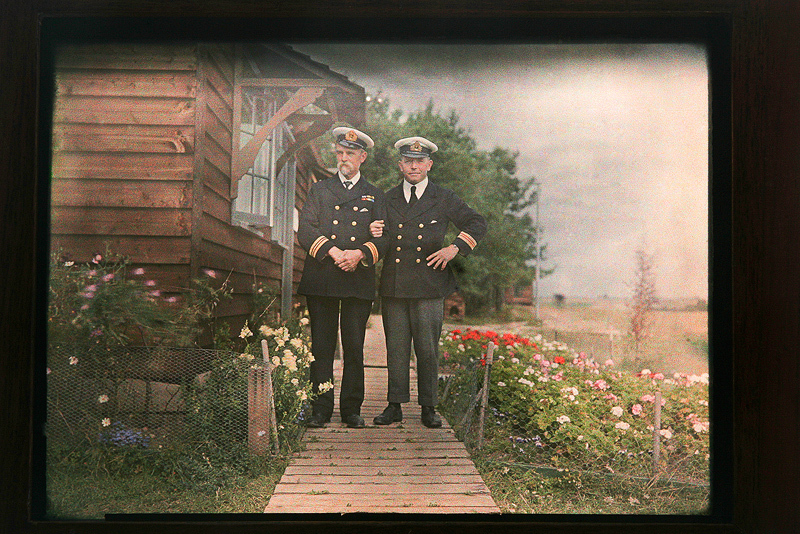 A bit of Google research helped narrow things down and I thought it was a Lumiere autochrome. However, a conversation with Janine Freestone, a friend in the photographic world who has a masters degree in historic photographic processes and lectures about them, threw up the possibility of it being a Dufay dioptichrome instead. She said an examination of the original would allow her to give a definitive answer – apparently the grain structure would give more information – but by then my client had passed it back to another family member so that examination wouldn’t be possible. I’m open to any help or suggestions from any experts out there! Anyway, what an interesting and educational process for me to go through. I’ve learnt about processes I had never even heard of and had the privilege of seeing quite a rare piece of photographic history. “I have had some very successful prints made up for interested family members and having checked the service record of the possible ancestor, it appears he was serving in France in Vendome during WW1 at the time of the photo. It is even possible that it was taken there as I understand that despite the flying activity there was time to do gardening as well! If the client is happy then I’m happy.